Kids on a Swing | THERMO Spoken Here! Calculate the final angle the boys and swing will attain. ♦ Our obvious system is the two masses (let it be two boys) with their positions constrained by the swing. (Even if we knew the mass of the swing we would ignore it for this first calculation). The event is "incremental" in time. We write the Extrinsic Energy Equation omitting friction work - it is small. Furthermore, no one is pushing the swing, meaning ΣW = 0. The initial and final velocities of the boys are zero. Potential energy change is expected. We will use the second option. 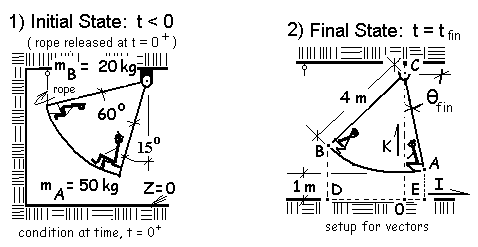 The initial angle is 15°, and the final angle is θfin. What next? Well, the geometry of the swing will tell us all of the values of z for any θ. But even with that, the above equation has two unknowns which are the final angle θfinand the friction work W1-2,friction. What can we do? Well the swing has flexible ropes and as sure as water flows downhill, the boys will swing until they arrive at a final angle that corresponds to the second, least possible potential energy they might have (constrained as they are). In the above energy equation, the potential energy of boys is written as a function of angle, θ. We will use the geometry to write the elevations, (z's) in terms of θ, then differentiate that expression, set the result equal to zero and solve for θfin, least PE. The θ we seek is constrained by the second position; the angle θ. Vectors provide a disciplined approach to write these final positions. The final elevation of boy A, equals the distance between points A and E. We sketch a vector origin and basis on the figure and start our vector path at O. And by the K component again. Let us create two simple cases to check the "truth" of this equation. i) If the mass of boy B is zero, after the swing stops, Boy A will be vertically below the pivot and the swing angle, by our result, had better be 90 degrees. ii) If the mass of boy A equals zero, the final position of the swing will have an angle with horizontal of 30 degrees. As a final step we can apply this information to the energy equation. In conclusion, we see the system potential energy change was - 352.3 Joules which equals the friction work of the event.